In April 2018, Hearst bought a minority stake in Gear Patrol, an enthusiast men’s brand focused on products and stories about the outdoors. Beyond Gear Patrol’s ability to drive millions in web traffic, they also sell a lot of product. It’s content and commerce at its finest. A niche audience focused on high-quality gear presented around a story that makes you want that item even more. It is what Lucky Magazine always strived to be. It is what The Glossy does really, really well today. But those more household name brands aren’t the only ones out there using content to sell and scale. In fact, more than 30% of the world’s websites use WordPress, both as a content and commerce hub. That makes WordPress the most widely used website software in the world. And the success of many of the brands using WordPress has spawned an ecommerce business model and strategy: WordPress Ecommerce. Therefore, optimizing your WordPress Ecommerce site is as important as ever. Exactly what a WordPress ecommerce strategy is, and why you should use it. Examples of using a funnel from content to conversion via WordPress ecommerce. The history of WordPress and fun facts you need to know if you’re looking to become an active member of the WordPress community. A quick ecommerce FAQ to help you start selling products on a WordPress site. WordPress provides the foundation for more than 30% of the world’s websites – many of which sell goods alongside their storytelling. Build community and customer lifetime value through their owned website rather than through a marketplace like Amazon. Achieve organic search visibility and decrease paid PPC costs, subsequently increasing ROAS or testing new keyword waters with the saved money. Nurture customers through a longer buying cycle. Think more expensive products, B2B, etc. Deploy a headless commerce model, the newest and increasingly most successful model to becoming truly omni-channel without the headaches of the buzzword. Outside of the B2B scope, the main purpose of this strategy is to build a brand with high customer lifetime value, i.e. a fantastic customer experience from awareness through retention. You’ll need content – a lot of it. Your SEO will need to be top notch. Your site will need to load quickly (no lag time, despite the amount of content or images hosted, catalog size, etc.). Your data orchestration (depending on business size) will need to be humming along perfectly. And you’ll need a whole lot more than just a checkout experience. You’ll need a full funnel customer experience. You’ll need to offer education and solve potential new customers’ niche problems. You’ll need to inspire, and build a community around trust and common interest. You’ll need to get that community to come back to you, time and time again, to learn, to engage, and to buy. This is the strategy for moving beyond a transactional business model, which has high advertising costs and low lifetime value, into a customer-centric model, which has decreasing advertising costs and high lifetime value. In fact, ecommerce brands that build loyalty via lifestyle content and community building are some of the most successful out there. Using content and commerce is a full-funnel approach to scaling your business. It is often referred to as the customer value sales funnel. You don’t need WordPress ecommerce in order to build a customer value sales funnel. However, given WordPress’s ubiquity and familiarity across a variety of disciplines, it is often the choice presentation layer. Let’s look at a few examples of the customer value sales funnel. Goal: Educate and entertain new audiences, while actually helping folks solve niche problems. You’d expect that the brand majority owned by Kelly Slater, an 11-time world surf champion, would be subpar in no way. Firewire’s new site, launched on WordPress via the BigCommerce for WordPress plugin and designed by Matter Design agency, is a top-of-funnel driver. Using Kelly’s name as well as the The Surf Ranch in-person experience, the site drives high volumes of traffic and engages visitors with video heros, a volume calculator, information on their sustainability and technology, as well as blog posts about experienced surfers using their boards. Goal: Win trust with an unparalleled site experience that engages users landing on your pages – and piques their interest to explore more. 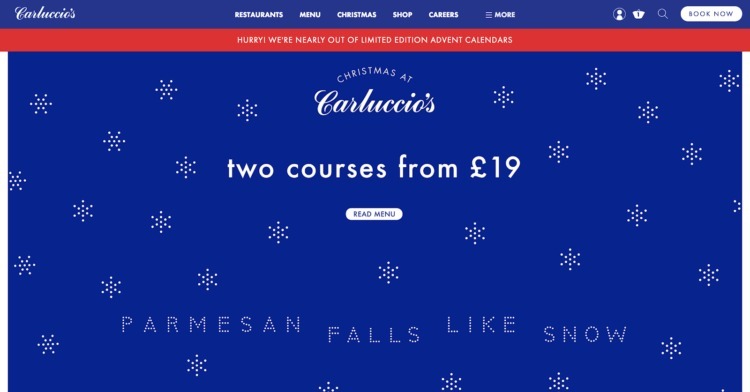 You don’t just shop for food items at the famous Carluccio’s online store –– you also browse recipes for your holidays (including a variety for folks with dietary restrictions), or explore where the restaurant chain can be found. From there, you can view open and closing times as well as book yourself a seat right away. Carluccio’s WordPress ecommerce website is the perfect blend of experiential bookings and buying opportunities where every consumer touchpoint and opportunity explore more has been thought through in incredible detail. Goal: Convert to sale and build a post-sale funnel experience, i.e. give your new customer gratification. A single, one-page checkout with the option to be a guest or login, with very clear pricing and shipping information, is the best way to close the sales at checkout. Instead, be up front about total costs, make it easy to insert information (use digital wallets even!) and ensure you are PCI compliant and have fraud protection (the benefits of a SaaS platform for your checkout) for your customers. 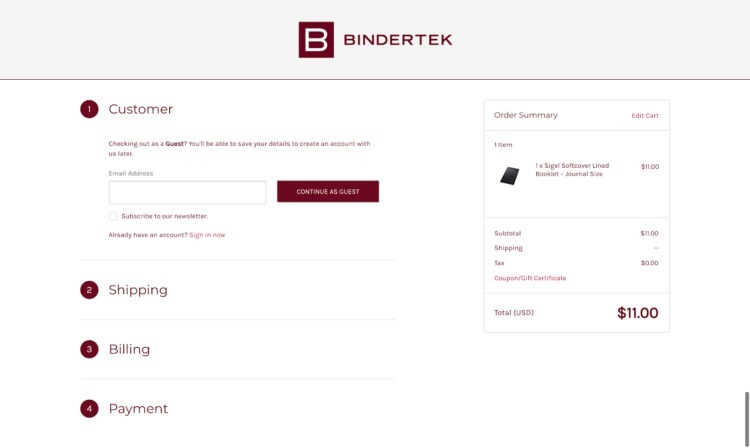 Bindertek is a great example of a clear checkout process to help folks get across the line, and get the products they want in their hands. What many of these brands have in common beyond a content and commerce strategy is that they are using a combination of WordPress with BigCommerce. But how did WordPress become a defacto choice for this business model? To answer that question, I chatted with BigCommerce’s in-house WordPress expert and advocate, Topher DeRosia. Turns out, the history of how WordPress came to dominate the commerce industry is just as fascinating as where that industry is heading today. Here is everything Topher wants you to know about WordPress, WordPress ecommerce and more before diving in. From here on out, this is Topher’s take on the state of the WordPress ecommerce industry and what is coming next. You can read Topher’s years of musing about WordPress here, follow him on Twitter, or connect with on LinkedIn. WordPress, WooCommerce, Automattic; Who’s on Third? It is extremely common for people to confuse the ownership of various, common WordPress entities. Let’s begin by talking about a license. WordPress is a piece of software. It’s not a company, or an organization. It is just a piece of software, like Microsoft Office. The license for WordPress is the General Public License (GPL), and it says 2 important things. Anyone who wants to may take the software and do anything they want with it, no restrictions. This means that YOU, dear reader, could download WordPress, search and replace “WordPress” to “BigCommercePress”, and open a storefront selling it. Perfectly legal. If you make changes and release them, those changes must ALSO be under the same license. So if you DID do that with WordPress, someone else could take YOUR work, and do the same. This also means that the BigCommerce WordPress plugin we’ve been working on is totally free to anyone who wants it, and they could take it and change it and resell it. This is what Free Software means. You can sell Free Software, because it’s not “free” in the sense of free beer, it’s Free in the same sense that Speech is free. “Free as in Speech, not as in beer” is a common phrase. One more important note: Open Source is NOT the same as Free Software. You can have Open Source where anyone can see that source, but they’re not free to take and change it. At the same time, everyone, and no one. YOU own WordPress as much as I do, and as much as anyone else does. So, when someone says “Automattic owns WordPress” it comes across as not really understanding how the entire ecosystem works. But just because the software is Free, the name is not. Nor is the logo. It is all copyrighted, and you must get permission before using either in most cases. For example, you may not include the word “WordPress” in ANY web address and http://my-wordpress-store.com would get you a call from a lawyer quite quickly. OK, finally, who owns WordPress.org? Not Automattic, but Matt Mullenweg personally, one of the two co-founders of WordPress. What does Automattic own, then? Automattic built a large server farm and installed WordPress on it. Then, they allowed people to login and create free blog accounts. Then they started charging for add-ons, like custom domain names, better themes, better plugins etc. It’s called WordPress.com, and it’s the most visible product they have. WooCommerce is also under the GPL, which means Automattic does NOT own it. Everyone and no one owns it. So, we could take it and make BigWooPress and it would be totally legal. Automattic DOES, however, own all of the branding for WooCommerce. They own the name, the logo, etc., and they defend that vigorously. Have you ever noticed there are three T’s in Automattic? That’s in honor of Matt Mullenweg. WordPress is camelcase, just like BigCommerce. One word, two capital letters. WordPress (with a lowercase ‘P’) immediately marks you as an outsider who Doesn’t Understand. WordPress.org is a site where you can go download the WordPress software, themes, and plugins, and get some community-based support. It’s owned personally by Matt Mullenweg. WordPress.com is a site where you can go and sign up for a free, hosted blog, and optionally pay for some added features. Before 2010, ecommerce in WordPress wasn’t really viable. Most people who tried it tied it tightly to the WordPress Theme, which then meant that the site owner could never change themes if they wanted to keep their products. Integration with payment gateways were almost non-existent, with most people relying on Pay Now buttons from Paypal. One notable exception was a plugin called WP-eCommerce. That plugin still exists. With version 3.0, Custom Content Types came into being. Here are some quick examples to explain what they are. BCCT, there were two types, Posts and Pages. Their metadata was things like date published, author, etc. Typical blog data. ACCT, we were allowed to create any types we wanted. A Staff custom content type would have meta like phone number, email address, title, etc. A Vehicle content type might have meta data for year, make, and model. People very quickly realized the possibilities of a Product content type with metadata like price, size, weight, etc. WP-eCommerce is the only plugin that converted as opposed to simply giving up and going away. Throughout 2010 and into 2011, a wide variety of people and companies tried their hand at ecommerce in WordPress, and none were great. One that seemed to be moving toward the top was called Jigoshop. In 2011, WooThemes tried to buy Jigoshop. Jigoshop rebuffed them, and so WooThemes leveraged their right under the General Public License to fork the Jigoshop codebase, and hired away two of the project’s lead developers. This was the first time in the history of WordPress that one company had publicly taken another company’s entire codebase and started over with it. WooCommerce was born and opinions abounded. Many people were upset at the “code theft” but no one disputed that it was good to have a company finally stand up behind WordPress ecommerce and put time and money into it. In April of 2015, a freelancer named Pippin Williamson released Easy Digital Downloads, an ecommerce plugin for selling non-physical things. He wanted to sell his own plugins and didn’t like any of the current offerings in WordPress. Since then, it has grown to over a million dollars in sales per year with more than 10 people on the EDD team. It is the absolute best at what it’s designed for, and doesn’t work at all for things it wasn’t designed for. Before WordPress 3.0 in 2010, it was fairly common for plugins to make custom database tables in MySQL. For the most part this was fine, but lead to occasional compatibility problems. With 3.0 and the new custom content type flexibility, the prevailing philosophy was that everything should fit inside the custom content type paradigm. WP-eCommerce spent an enormous amount of time, money, and energy converting their plugin to use custom content types. And it wasn’t only ecommerce plugins. BuddyPress, a very large community plugin, did the same thing. WooCommerce and EDD were both born during this age, and both built their entire Product structure around WordPress’ concept of Post Data and Meta Data. The problem with this is that that structure is very, very slow to search across metadata. This doesn’t only apply to people searching for things, but WordPress pulling together all the parts of a product, as well. This is one of the fundamental reasons that WooCommerce has performance issues today. EDD began converting back to custom tables in 2016 and has largely completed that journey. WooCommerce, because of its large customer base, hasn’t been able to move as quickly. In 2016, Automattic purchased the company named WooThemes to gain access to everything related to WooCommerce. WooCommerce is Free Software of course, but Automattic immediately acquired all of the WooCommerce developers, support staff, marketing team, and all of the intellectual property related to WooCommerce. Automattic has a plugin call Jetpack that allows people to leverage the power of the WordPress.com server for a wide variety of tasks. For example, if you use their image service, when you upload a huge image, it goes to their servers for processing, and is then served from there as a CDN. The local server takes no processing hit. Another example is Akismet which is an anti-spam service that is built into Jetpack as well. All email processing is done on the WordPress.com servers. Automattic has been moving more and more WooCommerce functionality into Jetpack. As of July 2018, their shipping, taxes, and Stripe functionalities are all built into Jetpack. There are many more things that could take advantage of this remote server approach, including stats processing, which is one of the greatest pain points of WooCommerce. 2018: BigCommerce launches BigCommerce for WordPress using APIs. BigCommerce has an extremely robust API for ecommerce, and in 2018 decided to leverage that to build a new ecommerce plugin for WordPress. At the time of this writing, WordPress is used to power 32% of the web, which makes it a very powerful tool to leverage ecommerce as a whole. Speed is greatly increased as things like sales calculations are moved to the server. Integrations are more widely available since they only need to work on one server. Security becomes much tighter as PCI compliance is moved to the experts on the server. Speed, flexibility, and security make for an extremely powerful platform for ecommerce. Running ecommerce services over an API solves many of the problems of any locally stored WordPress ecommerce plugin. There are two commonly held WordPress beliefs and mantras that will come up through this model, however. The “Own Your Content” Philosophy. The Community and the active, always-on resource. Medium is one of the largest competitors of WordPress in the writing space, but Medium lays claim to many rights over what you’ve written. Every time they squeeze a little more, the WordPress community shouts “Own Your Content!,” which is to say, don’t place your material in the hands of a third party which could hurt you someday. Using a SaaS platform like BigCommerce can spark similar fears. What if they turn evil? What if we get bought by Adobe (as has happened with ecommerce software before)? The solution to this is making a system for leaving BigCommerce easy – i.e. You own your data. There is precedent for this: Facebook and Twitter both faced this problem, and both ended up creating a way for people to download their entire social history in one button click, and then erasing that history from their servers in another button click. People want to own their own data. BigCommerce already provides a method of exporting everything – allowing you to take all of your data elsewhere. The WordPress community is socially very close and strongly influenced by the Free Software philosophy. This means there’s a great deal of transparency and accessibility. Almost always the developer of a given plugin is available to chat on Slack. Yoast SEO is one of the most popular plugins in the WordPress community, and the entire C-level staff is on WordPress Slack just about every day. Pippin Williamson of Easy Digital Downloads publishes a Year In Review each year, where he not only talks about his personal life, but publishes detailed sales data from all of the plugins his company sells. This is a great help to other plugin developers who need help with business vision. Over here at BigCommerce, I’ve been hired as that face and contact point for the community. Expect much more to come from here. And come chat with me at WordCamps! While I see API-driven ecommerce as the future of ecommerce in WordPress, I don’t see the alternative ever completely going away. There will always be tinfoil hat wearers who won’t trust what’s at the other end of the API. There will always people who’ve invested too much to switch. BigCommerce is new to this space. I know that simply showing up as an API-driven ecommerce plugin is great, but that alone won’t keep us great. We’ll need to continue to iterate, and provide the same great support that we provide now. And that is 100% on our roadmap for years to come. The perfect headless commerce integration for WordPress.